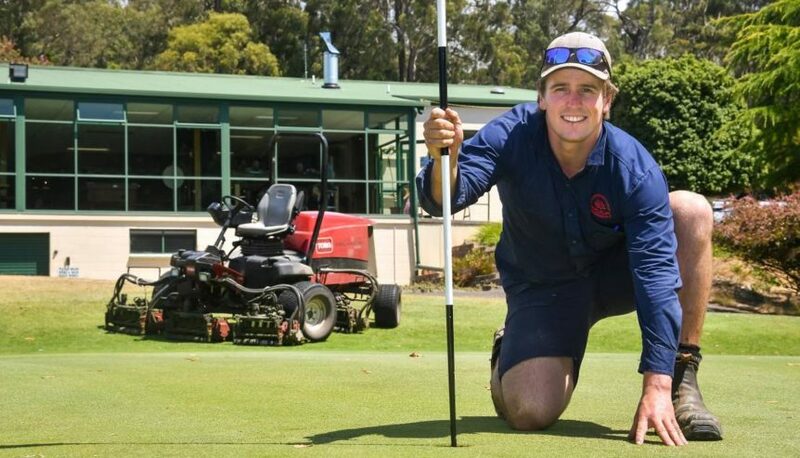 The summer weather conditions have been far from ideal for golf course preparation, but Ulverstone Golf Club course superintendent Izaac Jones has been enjoying the challenge. Ulverstone Golf Club is preparing its golf course for the Tasmanian Open from February 28 to March 3, the first time the course has hosted a state open since the Tasmanian Women’s Open in 2005. Jones was hired a year ago said it had been an eye-opening experience trying to set the course up for some of Tasmania’s and Australia’s best amateur golfers. “This is my first Open that I will be a part of and it has been a little bit interesting,” Jones said. “There is a lot of timing involved to get the greens, fairways and other stuff around the course ready to get it peaking at the right time. The main critique of the Ulverstone Golf Club over the past few years was how dry it would get over the summer months due to their dam being unable to hold enough water to last thorough the period. But Jones said the club had invested money in its dam, which has been crucial because the lack of rain the region has had this summer. “We have had a dam extension that has given us more water this year, from 13 megalitres up to 30 megalitres this year. “If we had our old dam, the fairways would have been cracking open because we would have had to stop watering in early January. “The course is always difficult to keep in top shape this time of year considering how hot and dry it is.